Underwater Fishing info about the game-Games2Rule. 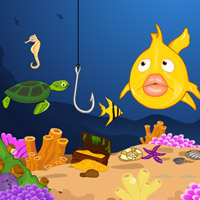 This Underwater Fishing is mouse based simple skill game. Catch as many fish as you can before time runs out. If you catch some dangerous fish, you will lose a life. Get 3 stars to move to the next level. The more fish you catch the higher your score will be. Good Luck!